Juan Cole had questioned the other day whether Israel has any war aims, “ordinary” countries when fighting wars usually have. Well, when looking at the map, it’s clear that there is only one aim: extermination. 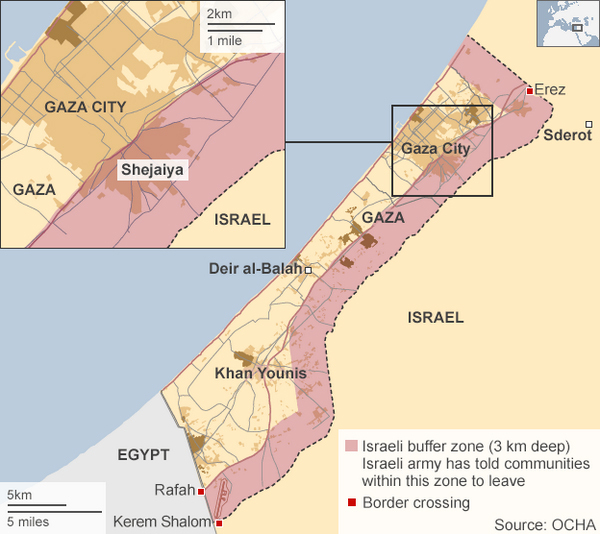 Gaza, one of the most densely populated areas on earth, has now been reduced by 44% (consider the pink areas as rubble) and people are told, vanish or die. Thanks to Democracy Now! which showed a tiny clip by Jon Snow today, British broadcaster from Chanel 4, who had recently returned from Gaza. He had just discovered that most of the Gazan people are quite young, actually children. For Israel’s sake, how to stop the murderous regime in Israel? 29 July 2014 @ 8:09 pm. This entry was posted in Israel, Palestine and tagged Gaza, Jon Snow, razing the ghetto. Bookmark the permalink.